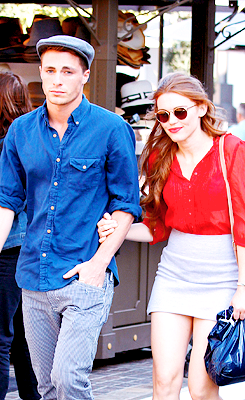 Colton and Holland. . Wallpaper and background images in the Colton Haynes club tagged: colton haynes colton and holland tumblr. This Colton Haynes fan art contains hip boot, thigh boot, boater, leghorn, panama, panama hat, sailor, skimmer, and straw hat. There might also be bare legs, pantyhose, skintight pants, skintight, hosiery, hose, and playsuit.